The teams are depending on a “Product Owner” for detailed clarifications. According to http://agilemanifesto.org and http://agilemanifesto.org/principles we value customer collaboration over contract negotiation, and our highest priority is to satisfy the customer through early and continuous delivery of valuable software. Therefore Agile teams talk to customers and users for those detailed clarifications. This is why we show users and stakeholders in our illustrations of Product Backlog Refinement. The teams aren’t cross functional. A cross functional team doesn’t only code and test, it also contains business domain expertise, UX/UI skills, etc. When I was on a team with a full-time UI designer, we didn’t need our Product Owner for every little detail. Geographic distribution, better described as dislocated teams. 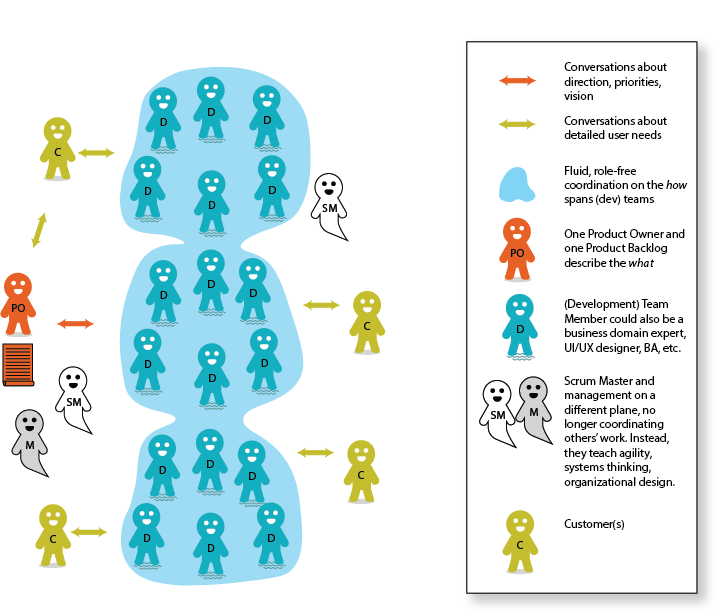 A common agility-reducing error is to ignore Ken Schwaber’s advice and artifically designate a team-member as a fake “Product Owner.” But the Scrum Guide has a good reason to state “Scrum recognizes no titles for Development Team members, regardless of the work being performed by the person.” The best architectures, requirements, and designs emerge from self-organizing teams. It is contradictory to tell a team that Bob the Business Analyst has special authority over the rest of the team members while simultaneously telling them to self organize. Bob belongs on our self organizing team without a process-imposed role.